Voted best new Party Place in 2012 Punta Cana! 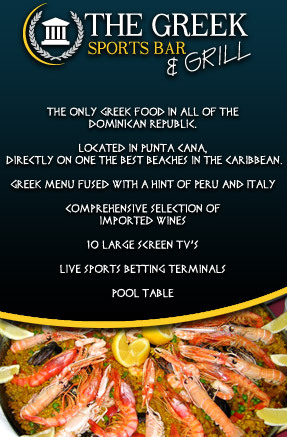 Its owner, Dimitri Vasiliadis, a Greek National, born in Toronto, Canada, descendent of Greek parents from the northern province of Macedonia, Greece, picked the ocean front location because of its year round tropical climate, wonderful Dominican people and established a niche in the heart of the tourism capital of the Western Hemisphere. The Greek is currently the only Greek Restaurant in the entire country and has as its Executive Chef, Anastasios Kosmas, a Greek native with over 40 years of experience in the restaurant industry. The Greek, offers traditional Greek Cuisine, such as Mousaka, Souvlaki, Saganaki, Tiropitakia and of course mouth watering dips such as Tzatziki and Taramosalata, most of the ingredients of which are imported from Canada and Greece. Combining these original recipes with some local flavor and fresh seafood (caught daily), provides an amazing and delicious continental menu which has quickly become the talk of the town. A collage of imported Greek Wines and other beverages offer tingling sensations to any savvy palate and services as a true compliment to the well thought out gastronomy of this five star establishment. Combined with an exquisite and diverse menu, the Greek offers a waterfront experience like no other where patrons can enjoy the powder white sand, an entourage of water sports and activities and at the same time catch the game on one of the many large screen t.v.´s located at the front of the building in the air conditioned sports lounge. Or if billiards or poker is your craving, The Greek also offers a slew of other entertainment activities that may catch your fancy, not to mention an in house DJ playing all your favorite songs, live bands, dancing to the moonlit beach at night, and much, much more. All this and open 24 hours per day, 7 days per week. The Greek has rapidly established itself as a premier landmark in THE BUSIEST resort town in the Caribbean and boasts the highest quality of food and best overall service as reported in the local newspapers. It currently ranks in the top ten overall amongst all restaurants in the country and without a doubt will continue to impress and content hungry foreign and national diners alike in the future.